The following information applies to both the MP5SD H.E. and the MP5KSD H.E. The MP5SD H.E. comes standard with a 12" Suppressor with suppression so effective that mechanical action noise is all you'll hear! The MP5KSD/SP89SD H.E. is equipped with a 10" Suppressor (8" on up available). We are offering our customers some-thing unusual in today's market, An MP5SD that is actually superior and quieter than the currently produced German MP5SD Dealer Sample! RDTS first came in contact with the MP5SD way back in April of 1988 when Fred Vollmer contacted us about doing some suppressor work for him. He had a MP5SD sent to us manufactured by Arville Selmyer of Qualified Manuf. We took it apart inspected it and compared it to HK factory information. We then built MP5SD’s for ourselves before offering them to our customers. We’ve been building and improving them ever since!! By the way at that time we were offering HK94’s for cost which was $600 when a customer bought a sear from us. RDTS is a company rapidly gaining a reputation for producing some of the most QUIET suppressed firearms today, with our MP5SD H.E. model as our flagship! To sell this complete weapon or upgrade on a customers MP5 we simply let them shoot it, then they grin, hand it back to us and say they want one or give us their weapon to upgrade. Sometimes its right on the spot if it’s an SP89 or an HK94 that we will paper as a SBR “Short barreled rifle”. If it’s a sear gun or registered receiver, paperwork “F5” back in 14-30 days takes care of it. We will gladly provide our customers and dealers with a Form 5 kit “An RDTS exclusive” that includes instructions and pre-filled in forms that they simply plug in info from their form 3 or 4. A few years back since John Norrel's Lawyer discovered Form 5 was a suggestion it is no longer mandatory for repairs. What makes the RDTS MP5SD HE special? It might be the first class machining...or maybe the better than factory TIG welding, radiused sight dust cover. Personally I like the zero maintenance high performance suppressor! In the following text we’ll try to explain what your hard earned buck gets you. We had a gentleman call us and tell us of his SD done as late as early 1991 (Note: This catalog has been around since 1990 with regular updates) that had the sight cap hack-sawed straight across, welds all around the sights rear section and ports that constantly shave jacket residue into the suppressor when they were not totally clogged up. Sometimes, especially if you are considering purchasing an MP5SD sight unseen or better yet sound not heard it is better to have it built on a sound MP5 or HK94. We charge more to fix a bad one than to start from scratch. And you'd be surprised that usually its more economical too!!! And you know EXACTLY what you'll get! The point we're trying to make is RDTS strives for consistently excellent work, for everybody, every time! Not a good one when an article is written or a demo performed. We are the owners and take pride in our workmanship. We are not a sweat shop out back and we don’t change employees every 2-3 years when they decide they know everything. What we did do though was rethink and redesign a system with unmatched suppression and virtually zero suppressor maintenance…..Also the suppressor shroud and supporting system that will withstand damage beyond the ability of the stamped sheet metal components of the factory system. First off we take your weapon and disassemble it, all parts are then put in its own storage container so your parts remain with your weapon. We then machine the following items: Cocking lever support, cocking tube, front site (bottom radiused were it meets shroud cage), sight cap (radiused), and bolt locking piece. Most of these operations are done on a machine jig to insure the same quality gun to gun. The 94 marking is TIG welded over and re-engraved “HK MP5SD“. We need to explain something about the engraving...as of 1998 we use custom plates made from a factory MP5SD dealer sample which includes the entire “HK MP5SD” this is the only way the “HK” and “MP5SD” markings will be in the correct factory positions. Also our method uses electrolyte etching which means no dents on your weapon. The engraving is sharp, crisp and indistinguishable from the factory engraving!!! RDTS engraving has always been very good, now its factory perfect. Also the barrel is turned down and cut to the factory length, crowned, and then threads machined at its base for the suppressor. When the barrel is ported we go beyond the method used by HK which is to use large ports grouped together at the base of the barrel (We feel this may cause a little more barrel flex and a weaker part). RDTS precision machines 42 ports IN THE RIFLING GROOVES (7 ports to each rifling groove) to approx. 2" beyond the base thread, another plus is we machine the ports at a very slight rear-ward angle to limit shaving the bullet. This reduces projectile residue buildup, and in conjunction with the ports being IN THE GROOVES gradually bleeds off the gasses to give you subsonic projectile velocity and unrivaled accuracy!! RDTS is the first if maybe only manufacturer to machine the SD cage from a piece of 120 wall DOM tubing! What this means is the end lips of the cage are one piece with the cage itself instead of tacked on sheet metal (HK's is stamped sheet metal) Of course there are machined cleaning slots to access the barrel for maintenance, then we precision fit and TIG WELD it to the weapon. Also TIG welded are the front site, cocking tube cap and sling stud. Let us point out, there are NO UNSIGHTLY WELDS ALL OVER THE FRONT SIGHT! We use ONLY HK MP5SD GERMAN HAND GUARD COVERS, these are the positive grip soft rubber style with a spring steel backing. We have had customers tell us that our SD conversion is much stronger and durable than HK's original! For example a client wanted his HK dealer sample SD's hand guard cage replaced because the stamped sheet steel was deformed during' a mishap. Another plus is our suppressor tubes are ALL STEEL not aluminum for a lifetime of rugged service! Our suppressor unscrews from the precision threads at the barrel base, has a knurled section to give a positive grip when removing, no spatter coating here. We also use a SUPPRESSOR BASE 0-RING to insure against the suppressor loosening off weapon. We use a DOM. steel tube with an OD of 1 5/8N and ID. of 1 1/2 . Our OD is only .040 (40 thousandths} larger than the factory MP5SD but the real difference is HK’s aluminum tube uses a thicker wall which decreases its I.D. and ultimately its gas volume. What this means is we have substantially more volume for trapping hot gasses while maintaining an actually nicer appearance.! And the sound signature of a steel suppressor is a dull thud as opposed to the pop of aluminum. In our suppressor we have gone to great expense to design a baffle that is ULTRA-EFFICIENT pressed out of 18-8 STAINLESS STEEL with an extreme radius to trap the hot gasses PLUS a built in shoulder to optimize the volume available in the suppressor. It takes fewer baffles to achieve optimum suppression, in our standard 12" SD H.E. there are only 6 baffles, which equates to more volume available and less area to attract carbon residue, this is truly state of the art! This suppressor requires no maintenance and has VERY CLOSE TOLERANCES so we seal the unit to prevent disassembly. By sealed we do not mean in a permanent manner, as the manufacturer we can open it up for major repair if necessary...your investment is safe with RDTS. We simply pin the base and encapsulator to seal the components in. The reason for this is because this unit is of such a close tolerance, (which by the way is one of the reasons this unit is superior in sound reduction!) we do not believe the average shooter has the proper equipment to reassemble and maintain the close tolerance. Plus none of our shop suppressors or customers suppressors have yet to require maintenance due to suppressor performance degradation. FEEL THE NEED TO CLEAN? For those who want to disassemble their suppressor we offer a more conventional baffling system that is almost as effective in sound reduction but can be disassembled and reassembled by the end user with reasonable mechanical skills. Keep in mind we have only been requested to do this variation 4 times. RDTS technicians then coat the baffles, rear cooling/expansion chamber, interior of end caps and threads with "SP1000" (coating descriptions and specs elsewhere in catalog) and thermally bond it on for a tough, maintenance free milspec finish. This material is unusual in that it is self lubricating, extremely corrosion resistant and of vital importance in a suppressor, carbon will not readily adhere to it. Also the advantage of not worrying about using corrosive surplus ammo, GO AHEAD!! Most carbon, crud etc. (the stuff that slowly clogs the suppressor) is blown out the end at each shot! A customer also informed us that his chamber, bolt face etc. doesn't build up with blow back residue as quickly as it did with his other SD, we attribute this to our coatings and pressure balancing modification that is done to our baffles to improve sound reduction. RDTS still recommends you always wear shooting glasses as any suppressor will increase the possibility of some blowback residue, primarily out the ejection port. RDTS Armorers carefully bead blasts the completed MP5SD H.E. inside and out, then it gets dipped in Pre-Cleaner to remove any trace of grease or residue. The weapon interior, bolt carrier, bolt head, locking piece and cocking support are all coated with RDTS proprietary finish "SP1000". Provides excellent lubrication in that it reduces the need for any solvents, preservatives or lubricants, but if you desire to lubricate with oil it enhances it slipperiness many times over than by oil alone! If your weapon is subject to extremely low temperatures or sandy environments where oil lubrication is not desired "SP1000" is the edge you can count on. This is a PERMANENT FINISH and becomes slicker the more bearing surfaces rub against each other! Another benefit of "SP1000" is that it is extremely corrosion resistant and not affected by many of the harshest chemicals around! The exterior of your MP5SD H.E. and the Suppressor is finished with "MX25" an EXACT HK BLACK that we defy anyone to distinguish one from the other!! "MX25" is also more durable than the HK factory finish. We guarantee, no wait! We defy you to tell from the West German factory black finish! You'll love this finish especially if you've ever sent a gun out for a new coat and got back something that looked and lasted like it came out of a hardware store spray can! Both the "SP1000" and "MX25" Coatings are thermally set in our shop ovens. Temperature and time depend on the finish being applied. Our specialty finishes will not flake, peel our come off with most solvents as is the case with some parkerized, then epoxy painted weapons. Epoxy also tends to be so thick as to blur or fill your weapons markings. How many manufactures have you called that actually real world test fire, ask you'll be surprised! Final Testing is performed on your MP5SD H.E. after it is carefully reassembled and checked for tolerances and oiled. Your weapon is given a basic sighting in and then fired in semi and full auto (where applicable i.e. Machinegun). On the machineguns we then do some full-auto testing to insure function. On the full auto weapons we also test with a factory sample group. This is to weed out function problems that may occur with an improperly done registered sear group...which is more common than people realize. If there is a problem with the your group we can bring it to factory spec if you desire. This is done on every weapon to insure factory reliability and positive function. RDTS goes the extra mile to insure you will not need to use the 5 year warranty given on our workmanship! So if one of the best suppressed systems in the world is what you desire give us a call! We've even had a customer with a DEALER SAMPLE STERLING PATCHET (SUPPRESSED) SUBMACHINE GUN which by the way is considered by experts to be the worlds quietest submachine gun, tell us he preferred, (after getting our MP5SD upgrade on his weapon) RDTS's MP5SD to the Suppressed Sterling!! Its was JUST AS QUIET but with no spring and less bolt noise than the open bolt Sterling! This device looks like a short factory suppressor, typically 2" past front site. The purpose of the Replica Suppressor is to facilitate the use of your MP5SD H.E. without the Suppressor installed. 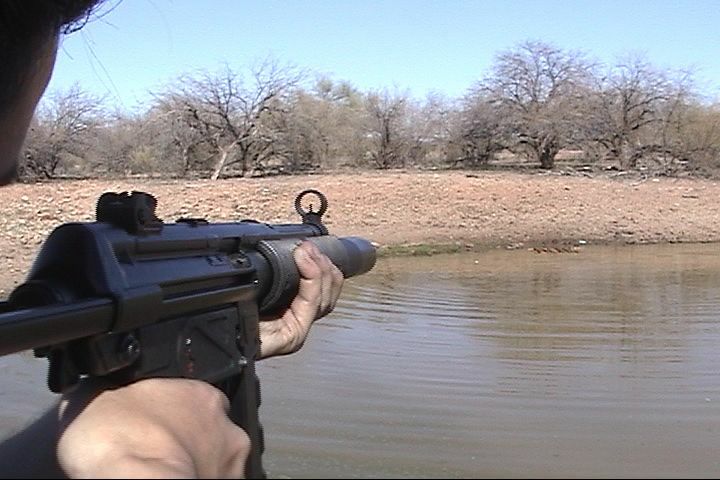 By blocking off the barrel ports the velocity of the 9mm projectile is raised back to its supersonic level, this is desirable when noise reduction is not a concern but penetration is. The standard MP5 locking piece should be used with the adapter because the MP5SD locking piece is set up to function under the reduced pressures present in the integrally suppressed weapon.